Seasoning a cast iron skillet is an important step to getting the best results out of using one of these very heavy pans. Many people purchase cast iron skillets without knowing that they have seasoned the skillet, and then don't understand the point of the pan when everything sticks or burns to the bottom. Seasoning the skillet properly takes time but once you do, it can last for generations. Keep in mind that new cast-iron skillets usually have a coating on them that helps to protect the surface. Before seasoning the pan this has to be removed. Companies in the United States use a type of wax that is food-safe but imported skillets have a water-soluble shellac applied. If your pan doesn't have this coating, you can skip straight to seasoning. Remove all packaging and stickers prior to seasoning the pan. Run the pan under hot water with a little soap to release the glue on the label. Mineral oil will also help with releasing the labels. Scrub the surface with steel wool, soap and hot tap water. Rinse the pan and thoroughly dry it before seasoning. Preheat your oven to 350 degrees and put one rack in the top third of the oven and another rack in the bottom third but cover it with foil in order to catch pan drippings. As a precaution you should open your windows and turn on your stove's fan as the skillet can smoke. Put your skillet over medium heat. Use about 1 tablespoon of vegetable shortening and rub it on the inside of the skillet in a thin layer using a paper towel and tongs. Place the skillet upside down on the rack with the foil. Leave in the oven for an hour then turn the oven off and allow the pan to cool to room temperature. Working in a skillet that has not been properly seasoned can lead to less than desirable results as you're cooking your food. Changes the porous surface of the cast iron causing it to be smoother. Makes it virtually impossible for food to stick to the bottom of the skillet. 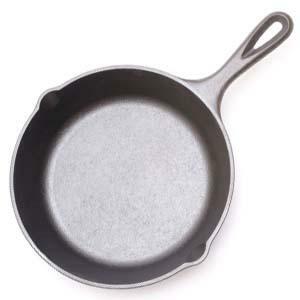 Failure to properly season a skillet will cause food to stick and in turn, it will shorten the life of your skillet.